Below you'll find a vast hand-picked collection of inspiring life quotes that have uplifted me, carried me, sustained me and changed my life in ways both large and small over the years. I offer these quotes of inspiration knowing they can do the same for you. "A human beings mind, once stretched by a new idea, never regains it's original dimensions." Inspiration isn't food for the soul – it's the language of the soul. When you're inspired, know it's your soul that is speaking to you through feeling and body sensations. The tingling going up your spine, the shiver sweeping through your body – these are sure indications that your soul is talking. And it makes us listen! 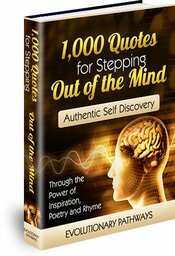 This collection includes many inspiring life quotes that have spoken to my soul over the years. Many of these inspired quotes still - to this day - invoke in me a sense of deep knowing and awe ... as if I've encountered them for the very first time. That's the magic of inspiration isn't it? It's always fresh and new - never old or 'has been'. I hope these inspirational life quotes will have the same effect and impact on you and your life as they had (and are still having) on mine. I have grouped the inspirational quotes into categories so that you may refer to the section that you instinctively feel will serve you best at this very moment. Don't think of these quotes of inspiration as mere entertainment or idle indulgence. Coming across the right inspirational life quote at the impeccable timing that life has chosen to bring you here - can be transformational to the deepest levels. With this intention and knowing these inspiring life quotes are offered here to you. Enjoy! "Watch your thoughts, for they become words. Watch your words, for they become actions. Watch your actions, for they become habits. Watch your habits, for they become character. Watch your character, for it becomes your destiny." Wisdom and laughter are a powerful combination. Laughter takes us out-of-the-mind and opens our heart. Words of wisdom that put a smile on your lips or laughter in your belly are a sure way to open up new pathways in both heart and mind. Who isn't a student of life? The classroom of life isn't one you can flunk, skip or avoid. We can learn the easy or the hard way; but we all learn nonetheless. When we listen to our instincts we tap into the wisdom of life. Reflecting with life quotes can help us do just that. Procrastination is no laughing matter, or is it? Read, enjoy and laugh yourself into action. Inspired life change is a daring adventure. Dusting off the cobwebs from forgotten recesses of the mind - leaving thought patterns and old negative fears behind - we break new ground. Life changing quotes inspire us to keep moving straight ahead. Negativity is often seen as an obstacle to conscious, positive life change. Could it also be an opportunity in disguise? A large log would present a threat to a small fire. But a large fire would take such a log as a blessing - turning it into mere fuel to burn even brighter. Reflect on these negativity quotes to help stoke your fire high. Have you ever tried to smile and feel angry at the same time? Have you ever tried hunching over and looking to the ground, while simultaneously trying to feel proud? Try connecting with someone with your back turned to them. Attitude is everything. It is a state of both body and mind. What do you think about when you hear the words 'hard work'? Do you think about struggle and suffering? Do you get a sinking feeling in your stomach and feel unmotivated? Or do you associate the words 'hard work' with possibilities? With a better future? With a better life? Thoughts and words lead to actions and habits, which in turn, shape character and destiny. Genetic tendencies are a given, yet much can be done to shape character and become the person we always hoped (knew) we could be. Reflecting on these character quotations can help. Discipline and freedom - rather than being diametric opposites - actually promote and support each other. Freedom without discipline is chaos. Discipline without freedom is oppression. Life change that is both disciplined and free is the most desirable and powerful of all. Insight and inspiration guide and uplift; while self-discipline executes. This is how we walk our evolutionary pathways. Life change is made difficult (if not impossible) without the cornerstone of trust. Trust is needed if we are ever to leave old thinking behind and step into something new. It is also needed in order to give ourselves the time and space needed for real life changes to take place. This is to trust the process of our lives. Conscious positive life change rarely comes knocking at our door; more often than not we need to go out and make it happen! If we wait, if we continue to passively watch life pass us by, we can never reliably expect to get what we want out of life. Taking initiative puts control back into our hands. Initiative is key to conscious positive life change.